Welcome to Six Flags Great America near Chicago in Gurnee, Illinois. The park has a couple of slow loading coasters, so I wanted to get them out of the way first. The first is Superman Ultimate Flight, a B&M Prone (Flying) Coaster. This is a great concept, but for some reason the loading procedures for this style of ride always create long lines - though that might be because most flying coasters are in Six Flags parks. The other coaster that you want to hit early is The Dark Knight Coaster. 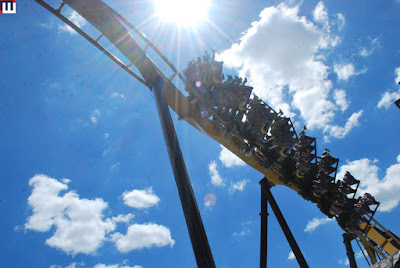 It is also prone to long lines mainly because it has a very low PPH thanks to its design of being a mouse coaster. I headed to Batman the Ride next. This B&M inverted coaster is the original and is still one of the best out there. The heavy forces created in this design still surprise me every time I ride it. One of my guilty pleasures is Intamin Impulse Coasters. So I had to ride Vertical Velocity. Also in this area is the new Joker Free Fly Coaster. This 4D coaster built by S&S/RMC has a great color scheme that really pops in this section of the park. This is the 2nd installation of this style of coaster I have been able to ride (should have been the 3rd but SFoT's was not open yet) and I have to admit that I really enjoy them and can see them popping up at all of the remaining Six Flags parks eventually. I know I have said it before, but I am so glad that the Little Dipper is at this park. Thankfully it was saved and brought here so I can continue to enjoy riding it. 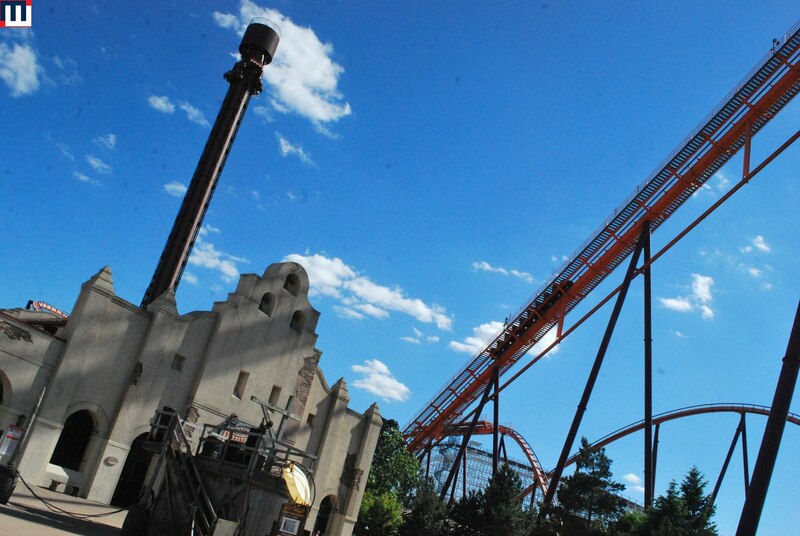 Goliath was my next destination. This RMC built wooden hybrid coaster is still trying to win me over. I personally feel that it is one of the weaker RMC installations out there. Is it possible that they tried to do too much with this coaster and instead came away with an inferior design? Don't get me wrong, it is enjoyable - but not something that forces a re-ride. American Eagle is looking great with its bright white wooden structure. It was only running the red side today which was disappointing. X-Flight is a B&M built Wing Coaster and remains the only one of its type in the chain. Honestly I am surprised that more of these have not appeared in other parks - especially the bigger parks in the chain. It's a fun ride. I rode Demon and immediately regretted it. I think a lot has to do with the fact I am a tall guy and I really do not fit comfortably in the trains of the older style loopers. I finally got to ride a 2nd generation Justice League ride. I really enjoyed the upgrades they made between the version they have in St. Louis and this one. I crushed the others in my cart with my final score. I figure if I took a few more laps it would have been even higher. This section has to be my favorite looking one in the entire park. Didn't have a chance to ride Giant Drop today, but I have in the past and have always enjoyed my rides. I instead got 3 laps on Raging Bull - a B&M built mega coaster. I have always enjoyed this coaster, but I cannot help but think back to the days when the trim (which you can see here) wasn't on so heavy. It really kills the middle part of the ride. I chose to ride on a "non wheel seat" and it was still pretty rough. I can only imagine how bad a wheel seat was. I don't remember it being this bad during my last visit. Whizzer is a Schwarzkopf built Jumbo Jet coaster and the oldest in the park. I have to ride this one every time I visit because it reminds me so much of the Zambezi Zinger that was once at Worlds of Fun - which was my favorite coaster as a child. I seriously always have a great time at this park. I wish it was closer to home.